Gose beers have grown on me in the past year or so, and now I would easily consider them my favourite summer style. Light, refreshing, sour and salty – wait am I describing my personality, or the beer? It’s a style I find delicious on a hot summer day, and I keep wanting to believe that the saltiness replenishes my electrolytes. I’m wrong, but that’s OK with me, as long as I can drink more gose beers. Nickel Brook Brewery has released Ceres Cucumber & Lime Gose under their funk lab brand, a celebration of all beers wild and sour. 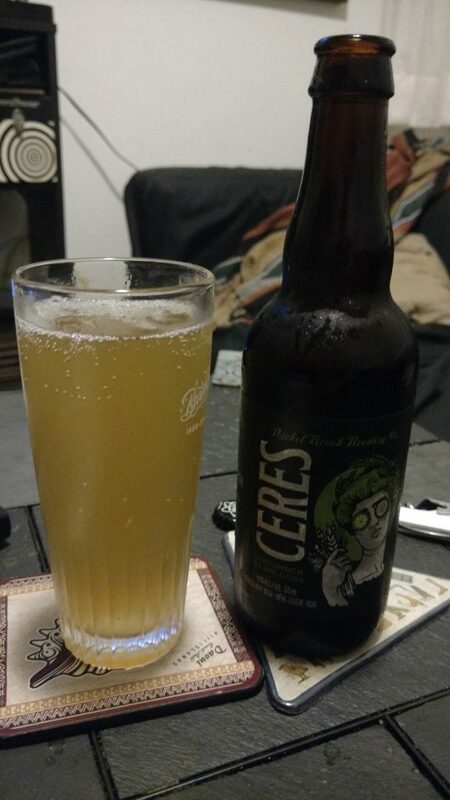 Ceres is named after the Roman goddess of agriculture and crops, and what a lovely bounty she has yielded with this beer. Brewed with wheat and barley, cucumber, lime, Himalayan sea salt and lactobacillus, a 375 ml bottle weighs in at a light 4% ABV with 0 IBU and will set you back $3.95 at the LCBO. Since there are no hops in this brew, it is best drunk super fresh. Perfect for a patio session! Appearance: Pale yellow, reminiscent of pineapple juice. Rapidly fading thin white head. Aroma: Cucumber salad, salty sea air. Taste: Light and salty, sour. Reminds me of tzaziki with the combination of cucumber, salt and lactobacillus. Aftertaste: Crisp and sour, the flavour does not linger. Overall: Pair with greek food – the cucumber, lime and lactobacillus are very inviting. It’s light enough to enjoy on its own, which I find rare. Delicious!